Moving the Windows taskbar from the bottom to the right side of the screen was probably the greatest layout change that I ever made or had to cope with since I started using Windows 95. The taskbar was at the bottom for more than ten years and one day I decided to move it from that position to the right side of the screen. I did that for a purpose of course, not to train my brain or as a test on how I handle new situations.Moving the taskbar to the side, either left or right is possible, increases the space that you have available for Windows that are displayed on it before the grouping feature kicks in. If you disabled the grouping feature, you may have noticed that window titles become unreadable quickly after opening a couple of programs and folders on your system. While you can sometimes use the icon to identify a program or folder, it quickly becomes a problem if multiple instances of the same program are open as you can't identify it properly anymore. I can put roughly 25 minimized windows on the taskbar when it is on the right (or left) side of the screen and all window titles are still readable. Compare that to the ten windows that I can read the titles of when the taskbar is at the bottom of the screen. But don't get me wrong. The first days after the change will be hard as you need time to cope with the new location, especially if you never moved the location of the taskbar before on your system. Your mouse cursor may automatically go to the bottom of the screen in the first days for instance as it is almost an automatic move. This may slow you down a bit on the first couple of days, but it should go back to normal after that time. Were is your taskbar located? Update: Windows 7 and newer versions of Windows shipped with improvements that allow you to add lots of program icons to the taskbar. It is for instance possible to always combine program windows and display them only as icons. This means that you can place lots of programs on the taskbar without running into space constraints. I explain why I have moved the Windows Taskbar to the right of the screen instead of keeping it at its default position at the bottom of it. Whlie the taskbar off to the side seems like a good idea, I actually decided to move mine to the left and use the “auto-hide taskbar” feature. Since my max resolution on my laptop is 1024×768 putting it on the side causes too much of a screen loss unless it’s set to auto-hide. And to reduce the chance of me clicking the [x] by mistake when I want to click start the left side made more sense. I’ve had mine on the left for a few years for similar reasons. More windows open/less grouping, full Date and Time Display (It displays Time, Day and Date in a Vertical Stack). I find the left more intuitive, as the top left pixel belongs to the start button, making it easy to click without positioning, as opposed to the right, where it is several pixels in. (Although with Launchy, I rarely use the Start Menu any more). Interesting! I’d be willing to give it a try (taskbar on the right/left side of the screen), but within a wide screen only. I have a 1280×1024 screen, 5:4 ratio therefor which is even less than a 4:3 in terms of “width spread”. But I agree, it’s all a matter of habits. Nevertheless, once the habit has been mastered, I guess true affinities become objective. Like in life, let us try alternatives before getting an opinion! It feels like I have more real-estate for viewing web pages etc. In reality, I dont. I have it on the left side of my primary monitor, which is also on the left side, and is 1920×1200. Then next to it I have pidgin docked. This way I make the most of the vertical space on my gigantic monitor, while taking up as much of the excess horizontal real estate. Meanwhile, I have thunderbird open at all times on my secondary monitor, which is a measly 17in LCD at 1280×1024. Having my taskbar and messaging client docked to the left lets me spread a window over the two displays, which is useful when I do video/graphics editing. I made the vertical taskbar move about a month or two ago and it took a week or two to get used to it (I tried it at least once months ago, and hated it). I believe I posted about putting the taskbar on the right side of the screen some months back here. I’ve had it this way since probably Win95. It just felt more comfortable, was easier to see things and made more sense to me. Of course, you must use “auto hide” for this to be most effective. And don’t forget that you can create custom toolbars on each screen edge also (Martin – you should probably do a post showing people how to do this). I have an additional toolbar on the left (also auto hidden) which contains my web email accounts and direct links to many forums that I visit on occasion. Also some Microsoft links such as to the KB. I label them “Forum – xxxxxx”, “Email – email ID”, “MS – xxxx”(for Microsoft), etc. Mine is at the left side of right monitor. :) I rarely open more than 10-12 apps, so half of it is dedicated to mirror desktop shortcuts, host launcher (SmartStartMenu) and clock in the tray, resized to fit huge taskbar (AlfaClock). PS I also tried to put performance indicators (Samurize) in taskbar but it doesn’t work – I look at them too often so top of main monitor is more comfy place. I keep mine at the bottom but I auto hide and also double its width. Why anyone would stick with a single width task bar is beyond me (assuming auto hide). I’ve had my taskbar on the RIGHT for a very long time now. And for the very same reasons everybody has pointed out. But on the topic of “left or right – which is better?”. Angelo has a valid point there, what if you click start menu when you wanted to click close? Although I’m used to double-clicking the left top icon of the window, I still think that if if it’s not in Auto-hide, right side is probably better. I got mine taskbar sometimes on right, sometimes on left, once a year I change it. When wide screens get popular I think its really best place for taskbar to have it on left/right side. Mine is also on the right side. I have a wide screen (1920×1200) so it fits better than way. I might consider moving it to the left but not to the top/bottom anymore. On a widescreen monitor, a side taskbar is only natural. For basic tasks, like browsing the web, vertical space is much more important than horizontal space. Both my browsers (opera and firefox) have also been modified to reduce the menu line and give more verical real estate. I still have a 4/3 screen at home, and I’ve kept my taskbar to the bottom – though I should try a side one (I prefer left side though). 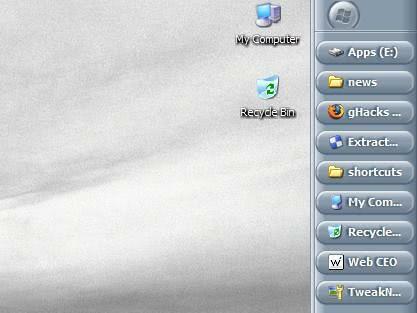 At work, on KDE, a taskbar on the side is awesomely neat. I realized the icons for the windows are actually much more useful than the text, and with a 30-pixel wide taskbar, I can make the text (mostly) invisible, while keeping the “quick launch” icons still bigger than the opened application windows. Love it. Much much nicer than the standard two-storied space for application windows tabs. I personally use Ubuntu Linux, and have my environment resembling that of my macbook for now. I use a custom dock, as well as various window themes. The dock allows me to have many more applications open, as it scales down in size when it reaches the edges of the screen. All text is still legible as well, because the text is a notification bubble over the dock item when you mouse over. Most applications are easy to distinguish because they appear as said applications icon. @Sean Kelly – I’m assuming you’re using AWN for the dock? I’ve tested the dock stuff myself on windows, mac and linux, and it just feels awkward to me, Even after a few weeks of use. does anyone know if there is a way to move the start button from top to bottom in the vertical menus ? Mine is on the left for the same reasons as Angelo – don’t want to hit ‘x’ by mistake and also it makes it hard to access the scrollbar. Crazy, i did exactly the same decision maybe 3-4 Years ago, some friends called me stupid/crazy, but most of them now uses also the left/right side for there taskbar. what would really be nice is if I could have the taskbar on the left hand side of the screen, but have my start button at the bottom (ie. its original place) and have the systray at the top right corner…. any ideas? Kevyn I have researched if there was a way to move the Start Button from top to button in vertical taskbars but apparently there is no way to do that. Found this while searching. It makes the Start Menu move across the screen to the right. Unfortunately you cant stop it, and it keeps moving. Have had the taskbar on RHS without autohide for years now for all the reasons previously stated. I have the exact same problem with the width of my vertical taskbar. It’s a freaking pain, and I don’t know a workaround or registry setting. Google wasn’t able to find any cure either. Somehow my tasbar is on the left edge of my screen. It covers the first inch of screen information. How do I put it back to the bottom? Well you basically have to right-click the taskbar, make sure that “Lock the taskbar” is not selected and drag and drop it to another location. i really need help on moving my taskbar from the right hand side back to the bottom on the screen. ive tried dragging it but this just results to making the taskbar bigger, can anyone please help me!?!! I’ve been taskbarring on the RHS for years, and I just googled it because I wondered suddenly who else did, too. I love it because I don’t need to move my mouse very far to get between quick launch, start menu, and min/max/close buttons. I just got a tablet pc (Lenovo X61t) and now I’m thinking I want to spread stuff out more, so I don’t accidentally touch something inadvertently. I had my gadgets, clock,calendar, notes etc, at my right side, they were very usuful, I lost them, WHY, please help me with this. Tell me how to recupery my gadgets clock, calendar etc, they were always at my right side of the monitor.